Industry Experts released the global market report titled ‘Mining Equipment – A Global Market Overview’. This new report reveals that Metal and Mineral mining accounts for slightly over 70% consumption of the global mining equipment in 2016 while Coal mining occupies the remaining share. China is estimated to the largest market in 2016 and projected to be the fastest growing market during the 2017-2022 analysis period. Globally, the market for mining machinery and equipment is being propelled by the prospect of an increase in the production of metals, such as iron ore and copper, which is being steered by new expansions and projects. While the initial years of this decade witnessed a decline in sales of mining equipment, the global market for the same has been maintaining sustained growth that is being stimulated by an insatiable demand for mineable commodities, production of primary metals and mining materials emanating from the developing regions of Asia-Pacific, South America and Middle East & Africa. Demand for mining equipment has a direct correlation with the level of mining activity in any region, and with an increase in mining activities on a worldwide basis, the positive effect on equipment used in mining over the coming years would be quite evident. Regions in Asia-Pacific, such as China, Australia and India are reporting a rise in mining activities, with proposed iron ore extraction projects in Russia, Brazil and Africa also expected to bolster the market for mining equipment in these regions. The global markets for the mining equipment product categories and application areas are analyzed in terms of value in USD for 2012-2022 analysis period. Worldwide market for Mining Equipment is estimated at US$100 billion in 2016 and forecast to be US$107.3 billion in 2017 and is likely to grow at a CAGR of 7.9% between 2017 and 2022, and is projected to cross US$150 billion mark by 2022. 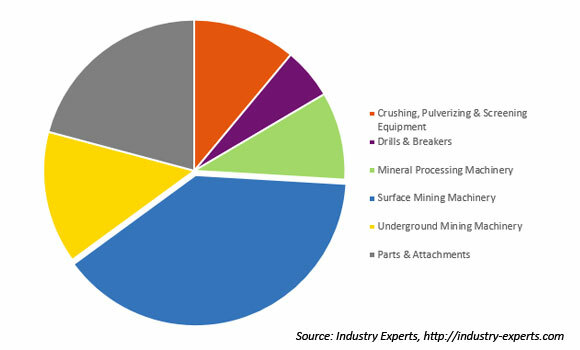 Surface Mining Machinery is estimated to account for the largest share with US$42 billion in 2017, of the global mining equipment market, while Parts & Attachments and Underground Mining Machinery to follow. The major categories of Mining Equipment covered in the report include Crushing, Pulverizing & Screening Equipment, Drills & Breakers, Mineral Processing Machinery, Surface Mining Machinery, Underground Mining Machinery and Parts & Attachments. Mining sectors explored in this report include Coal Mining, Metal Mining and Mineral Mining. Geographic regions analyzed for mining equipment market in this report comprise North America, Europe, China, Asia-Pacific, Latin America and Middle East & Africa. The regional markets further analyzed for 14 more independent countries across North America – The United States and Canada; Europe – Germany, Spain, Russia, Ukraine and Rest of Europe; Asia-Pacific – Australia, India and Rest of Asia-Pacific; Latin America – Brazil, Chile, Mexico, Peru and Rest of Latin America; and Middle East & Africa – South Africa and Middle East & Rest of Africa. The report analyzes the global market in each region for aforementioned key country by equipment category and mining sector while exploring the major market players. This 346 page global mining equipment market report includes 243 charts (includes a data table and graphical representation for each chart), supported with meaningful and easy to understand graphical presentation, of market numbers. This report profiles 20 key global players and 76 major players across North America – 18; Europe – 29; China – 16; Asia-Pacific – 10; and Middle East & Africa – 3. The study also provides the listing of the companies engaged in manufacturing and supply of Mining Equipment. The global list of companies covers the address, contact numbers and the website addresses of 186 companies.